Detailing the physical features, habits, territorial reach and other identifying qualities of the Pale Green Weevil. 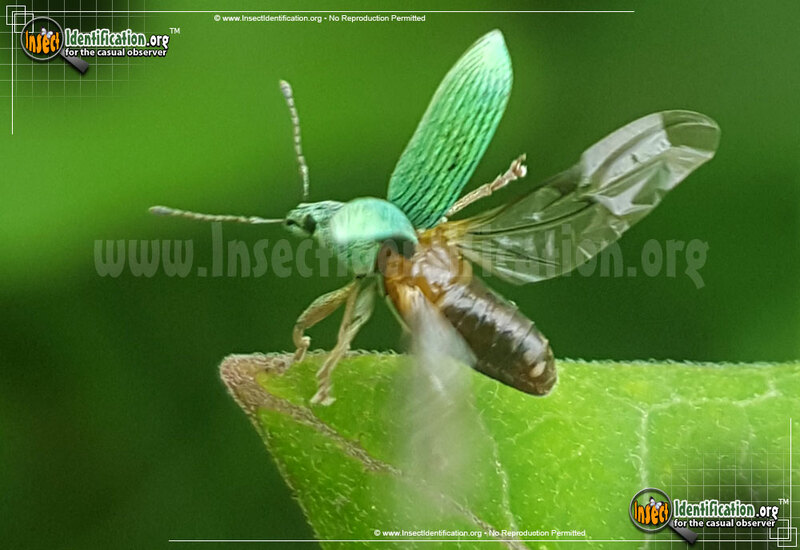 The light green body of the Pale Green Weevil helps hide it while it feasts for a short time on the leaves of various hardwood trees. The Pale Green Weevil is also known as the Leaf Weevil, a name more descriptive of its diet than its appearance. Pale Green Weevils are a bright green color with linear ridges on the elytra (wing coverings). Their green heads are marked with large black eyes and a small black line by the base of each bent antennae. The face is slightly flattened and long. They take flight when approached. This species is not native to North America and was transported from Europe in the early 1900's. The first documented sighting of them on this continent was in New York in 1906. The adults chew on the leaves of birch, maple, willow, and poplar trees as well as orchard trees like apple, pear, cherry, peach, and plum. Feeding only lasts a few weeks in the spring and early summer, so their impact on tree health is usually insignificant. They leave jagged edges on the leaves they have chewed, and are only a threat to the health of very young trees that do not have an abundance of branches and leaves yet. Orchards might have an annual inspection for this weevil in areas where new saplings are growing. Mature trees recover from any leaf loss by simply generating more leaves. Pale Green Weevil caterpillars are found in the soil at the base of host trees where they chew at the small roots emerging from the trunk at the soil line. Their feeding activity there is also considered insignificant unless the tree is young.